I’m home after a big adventure in Alaska. I’ll write more about that later, for now I’m catching up with email and twitter. Sorry if you’ve been waiting for a reply from me, I’ve been mostly out of touch. Many of you are writers. Keep writing! 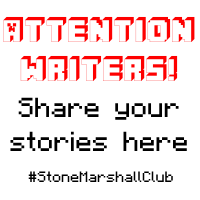 If you’ve asked me to read your story or write you a story then this link is for you https://stonemarshall.com/club/topic/story-share/ . Share your story with readers. Read stories written by my friends and comment. This is a fun place to share your stories and have fun reading! If you like Flynn’s Log 1, you’ll LOVE Flynn’s Log 2! Check it out here: https://stonemarshall.com/minecraft/flynns-log-2/ The preview is free! Read the first three log entries before you buy.